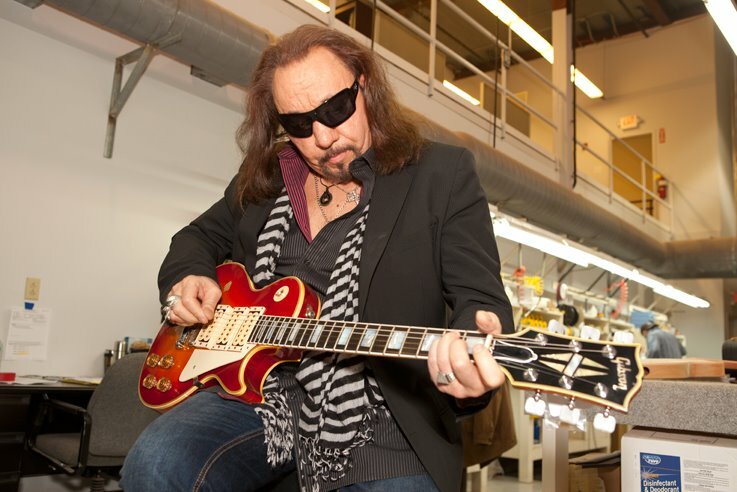 In the early summer of 2011, I became aware of and very loosely involved in discussions, with Gibson, surrounding the introduction of a new, Ace Frehley Signature model Les Paul. 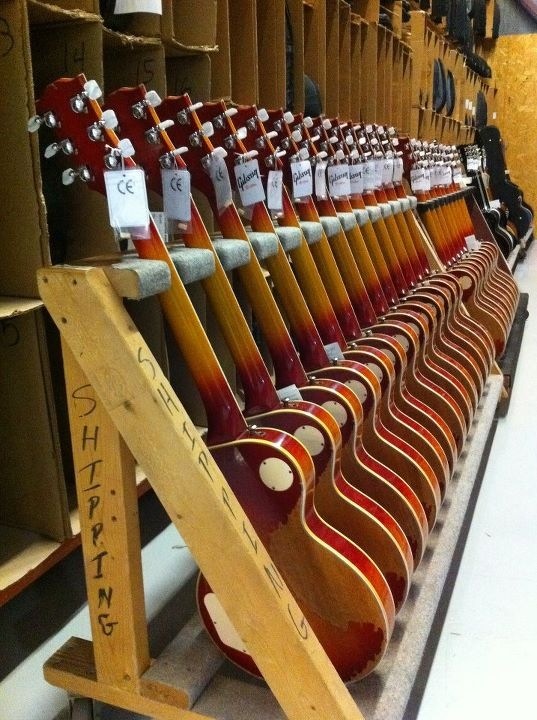 As I would learn, my website (this website) had become the "go-to" reference regarding Ace's guitars ... even for the powers-that-be, at Gibson !! (Wow ... was I ever flattered to hear that little tid-bit of information !) They HAD paid attention to my readers poll and all of our votes. 82% / 3,530 votes for this guitar. 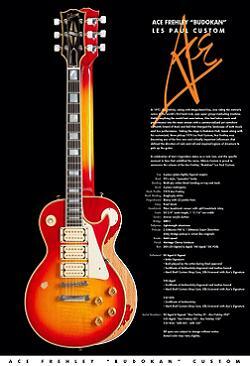 As Gibson Custom had been doing with recent, identical recreations of Billy Gibbons' "Pearly Gates" Les Paul, Slash's "Appetite For Destruction" Les Paul (the original is not actually a Gibson guitar, by the way) and Jimmy Page's "Number 1" and "Number 2" Les Pauls, as examples; this guitar would be a recreation of Ace's original 1974 Cherry-Burst Les Paul Custom ... one of the most iconic Les Pauls in music history. 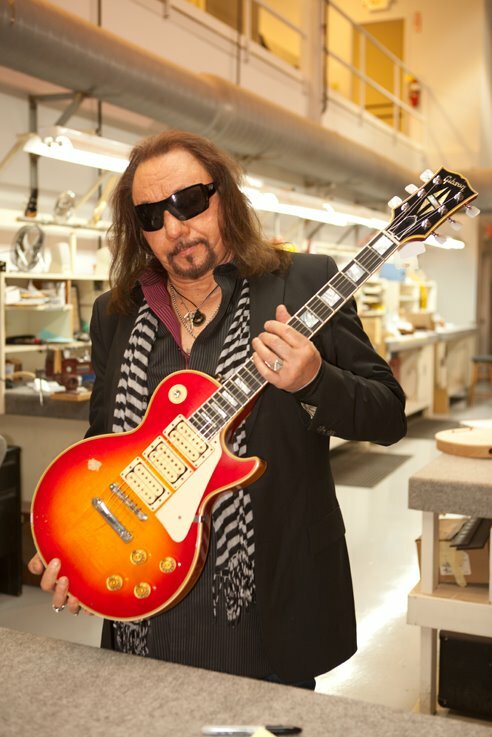 The Ace Frehley Budokan Les Paul became a reality. 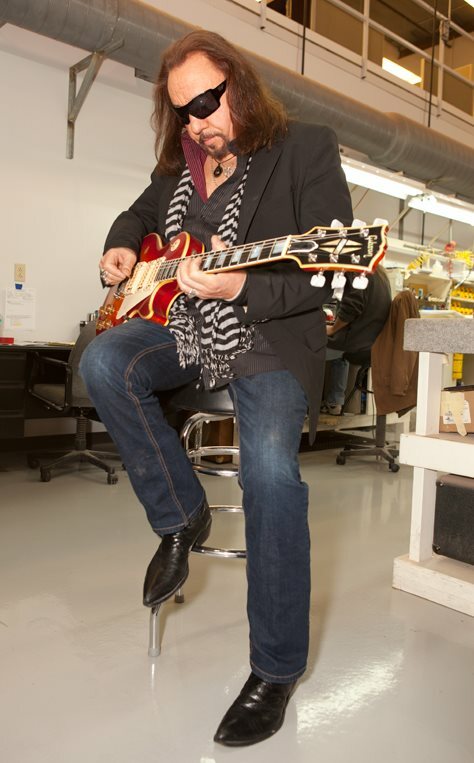 In 2009, I received an e-mail from a guy who said he was the current owner of Ace Frehley's original Cherry Burst Les Paul custom. To tell you the truth, I didn't even know, at that point, that Ace had sold it. That guy was Matt Swanson and he was willing to share any and all information, about the guitar. Right from our first conversation, Matt had always said that he wanted to pursue the opportunity of having Gibson re-create the guitar but wanted to know if I could assist with any details that may be overlooked by someone who wasn't as familiar with the various details of the original. Needless to say, I wasn't about to say 'No'. Interestingly enough, one of the first questions Matt asked me, was one that I didn't know the correct answer to ... What year is this guitar ? I figured the only person I knew, who might know the correct answer was Bill Baker. So, I contacted Bill, but he wasn't sure either. 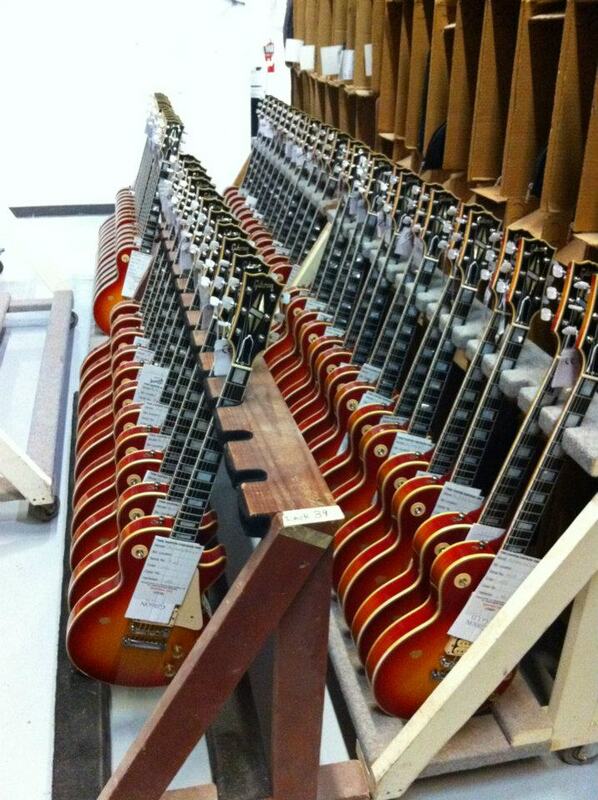 We knew the serial number Gibson had put on it. 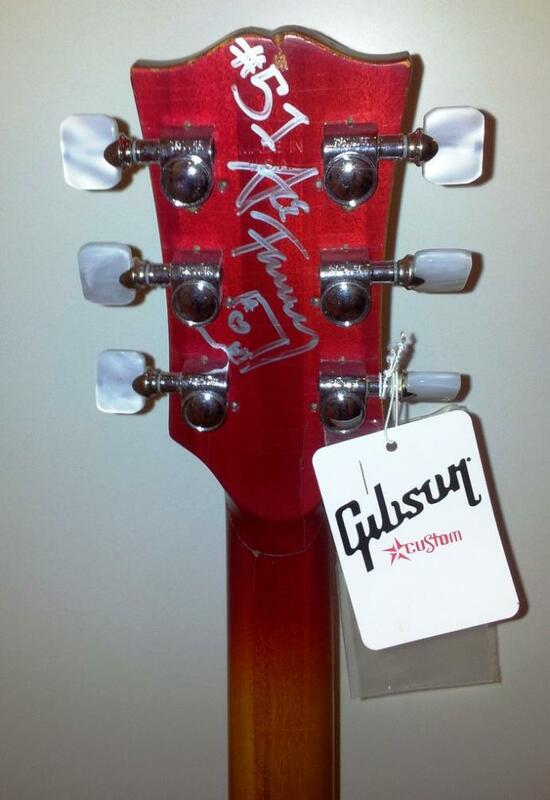 But, as I mentioned on the page discussing Ace's original 1974 Heritage Cherry Burst Les Paul Custom, serial numbers on Gibson guitars of the early to mid 1970's, didn't offer information that would tell us what year it was/is. So, the only way to roughly verify was by using the date codes, stamped into the potentiometers. When I passed this information along to Matt, he told me that he couldn't get the screws holding the pot-cavity plate into place, out of the guitar, with any normal amount of force. Understandably, he wasn't willing to cut them out or do anything that would potentially damage the guitar. 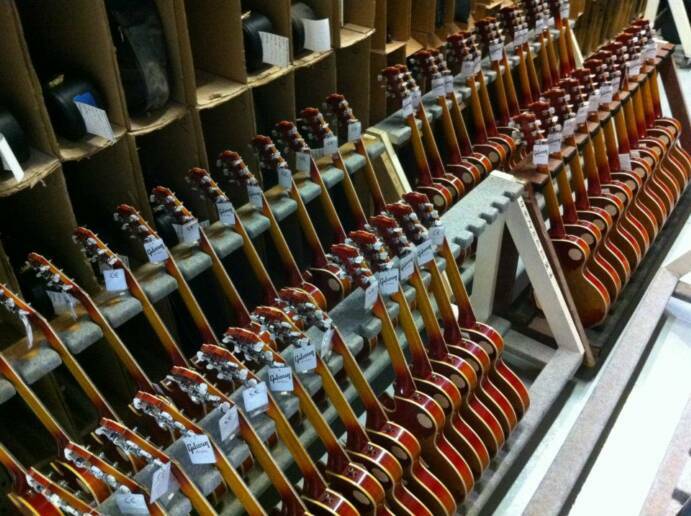 So, instead he opted to wait until he could get the guitar to the guys at Gibson, to confirm ALL the information about the guitar at one time. I agreed 100%. 1.) 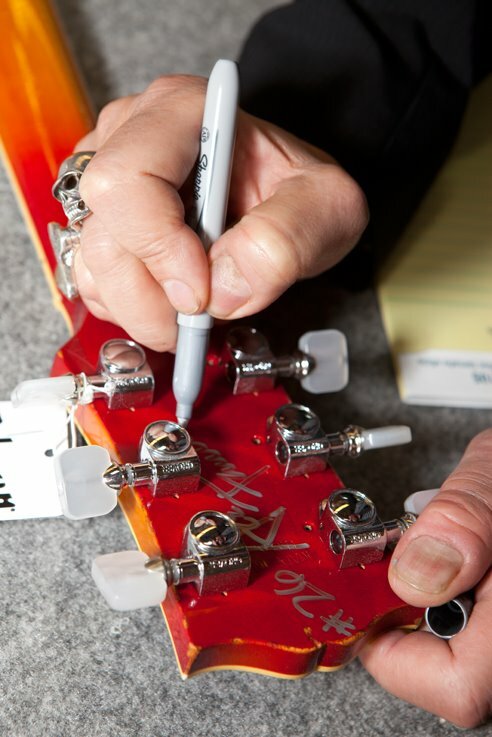 The tuners have to be ... nickle plated Grovers with square, banjo buttons and not the pearloid, kidney-bean shaped ones that were used in 1997. 2.) The pickups had to be ... 1x DiMarzio Super Distortion in the bridge position and 2x DiMarzio PAFs for the middle and neck positions (I didn't want to see a repeat of the pickup discrepency in The 300) and Matt agreed. John - "Does Ace recall where he got this guitar from? 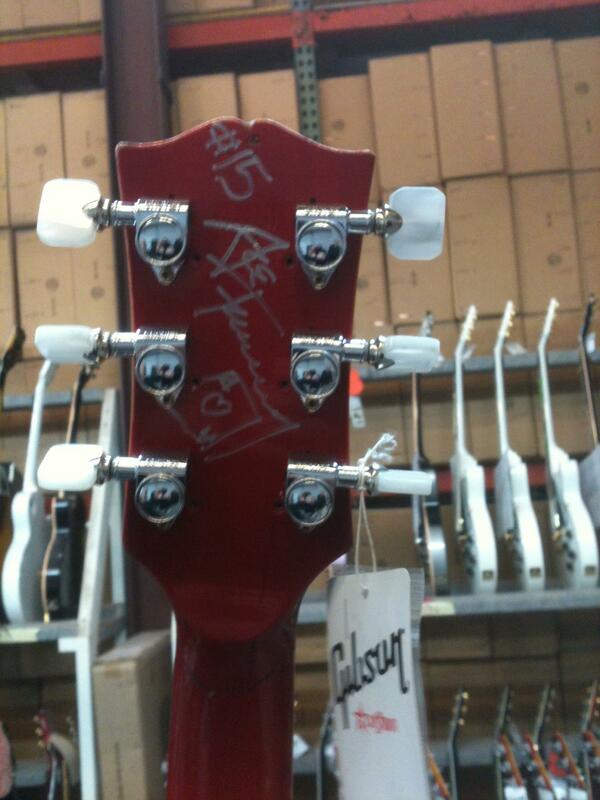 Was it an endorsement deal from Gibson or did he buy it from a shop somewhere"? Matt - "He thinks Manny's, where he got the tobacco". John - "So he got it in the fall of '76, most likely from Manny's". Matt - "He thinks earlier than the fall". This is the first and only time I've ever had such direct communication, with Ace. 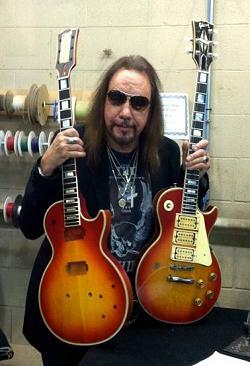 Add to that the fact that as this was unfolding; I was in direct contact with Matt, about the production of the forthcoming Ace Frehley Budokan Les Paul Custom, before anyone in the world outside of the two of us, Ace and a half dozen guys at Gibson knew about it !?!?! I was beside myself, to say the least !!!!!! 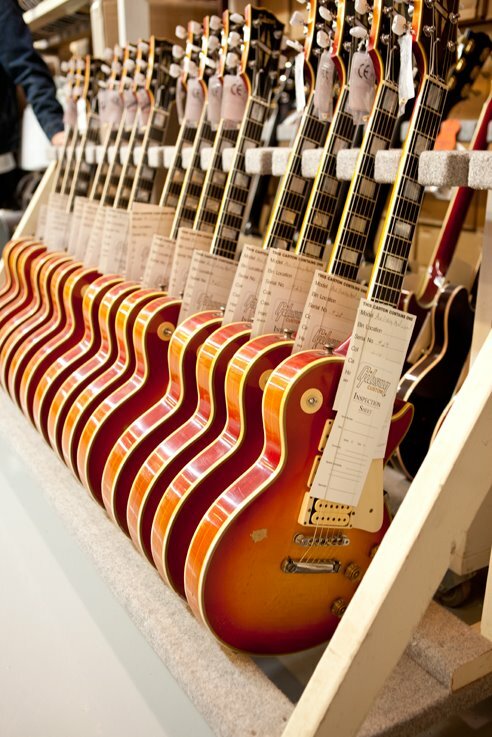 ** When the owner of an original guitar allows Gibson to use the guitar to study it and subsequently, replicate the original, the owner will sign a compensatory contract with Gibson. 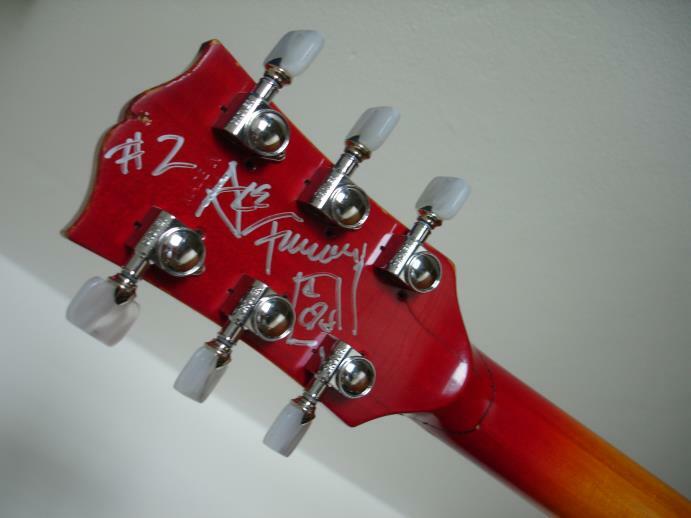 In Matt Swanson's case, a portion of his contract specified that he would receive the Aged & Signed Budokan guitar, "Ace Frehley #1" ... and he received that guitar. 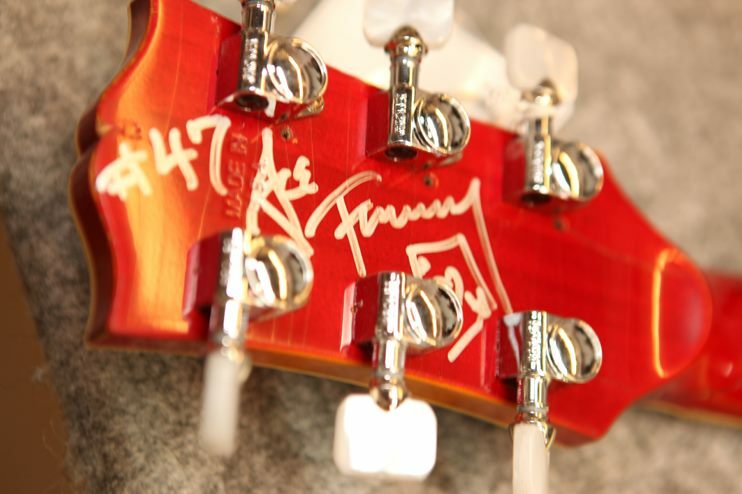 However, in order to stay true to the advertising that Gibson had released (see the .pdf file above), for the Budokan, which stated that "50 Aged & Signed guitars would be produced", they had to have Ace sign 51 guitars. #1 was contractually spoken for and wouldn't be available to the public. 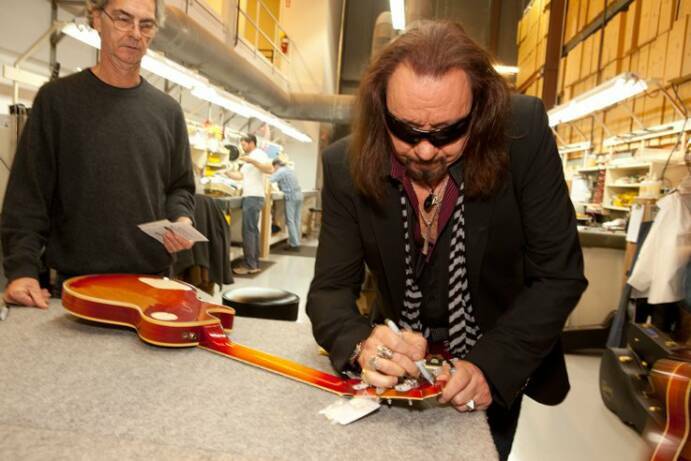 So, the public would have access to Aged & Signed Budokan models Ace Frehley #2 through Ace Frehley #51.